Valentine’s Day is a time to show some love to a significant person in your life. Many kids celebrate it with a party, candy, and valentines for all their friends and classmates. But it is also a time to show some love to others around you: friends, family, and others in your community. Jake and Max Klein are twin brothers who have a passion for volunteering and helping others do the same. They started the organization Kids That Do Good about two years ago, and the organization has continued to grow ever since. Kids That Do Good is a website database that helps kids and families locate volunteer opportunities available for their age. Keep reading to learn more about Jake and Max Klein! Jake and Max’s family has always done community service, and at a young age, they chose to forgo gifts at their birthday parties. Instead, they asked guests to donate money toward a charity of their choice. Jake and Max have chosen Cookies for Kids Cancer and the American Heart Association, as well as donations to several local places. They have come up with some really creative ways to help their community, such as donating bullet proof-vests and an electric stretcher to the police station and volunteer ambulance squad, respectively. When they were seven, Jake and Max were interested in volunteering with a family friend at the local homeless shelter to help cook. Unfortunately, he turned them down because they were too young and had to be 14 to cook. This led them on an everlasting mission to create a way to help other kids who were also facing a similar challenge: wanting to help but being denied because of their age. 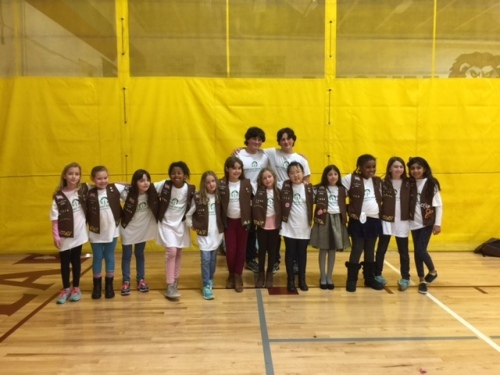 Jake and Max help the Girl Scouts. The small project that started with two twin brothers has grown into a large website that brings thousands of interested visitors each year. Jake and Max say that their website brings 35,000 unique viewers, and of those viewers, Kids That Do Good has connected kids to 16,000 organizations. Kids That Do Good even has two student board of directors, Steven and Jordan, who are also active in community service, as well as a group of adult advisors. Jake and Max were named Reader’s Digest Most Inspirational Kids of 2017 and have been featured on CBS. Jake and Max are busy with school and extracurricular activities, like DECA, their tennis team, and other community service commitments. Kids That Do Good has blog posts that advise kids on building their own charitable event. This February, Amazing Kids! Magazine encourages you to find a way to help others in your community and world. See what problems are existent in your community, and help others who are struggling with the same issue as well. Then, like Jake and Max, help implement a solution. We wish the best of luck to Jake and Max on their journey!